Al Simmons� one-man, multi-prop, music-filled, off the wall performances have elevated audiences worldwide to collective giggles and all-out guffaws. At once childlike in its simplicity and sophisticated in its execution, Al�s humour touches a responsive chord in people of all ages. In the tradition of the great comedy kings, Danny Kaye, Spike Jones and Jimmy Durante comes Al Simmons � a man dedicated to the all but lost art of combining comedy, with song, dance, magic, sight gags and of course bad puns. His costume-and-prop routines have often been the most popular and talked about act in theatres and concert halls and at folk, children�s and other festivals across North America. Al is a Parent�s Choice and Juno award winner. 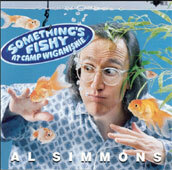 ...Fishy, is Al Simmons' debut album that takes young listeners on a madcap journey through an imaginary world of counting feathers, collecting rocks, eating pancakes, and wearing Lego underwear. Juno Award for best children�s album.